Home › Wildlife › Ruddy Hell! You can tell things are getting desperate, I’m even visiting Milton Keynes now. Actually, to be fair, in many respects MK is nowhere near as poor as some of its reputations would have you believe. If you are going to build a new, large conurbation, MK is done reasonable well and is certainly better than most of our other attempts. MK’s plethora of lakes, a.k.a. flood defences, are actually a decent home to waterfowl. There are also a number of parks and assorted green open spaces for other wildlife and people to enjoy. In the main, these come equipped with reasonable quality footpaths and the famed red way cycle paths. For a country lover such as myself, the only real problem with all these spaces is that you are still within earshot of the constant roar of traffic and it is a roar – many of the roads are unrestricted dual carriageways with the accompanying 70 mph speed limit. Herself and I visited one such flood defence/lake yesterday so she could get some practice using her new Lee Big Stopper, a 10-stop Neutral Density filter designed to slow exposures down dramatically for the landscape/seascape brigade. Being more of a critter kinda guy, while Big Lee was being stopped I amused myself watching the birds. 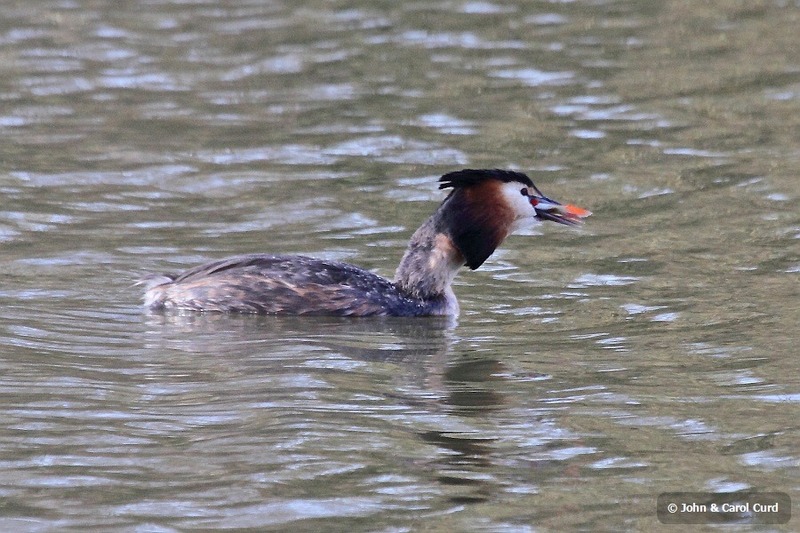 Of most interest was a pair of Great Crested Grebes (Poidceps cristatus) which are always a joy to see. I was hoping for a little display demonstration but, alas, no such luck – a bit late, maybe? 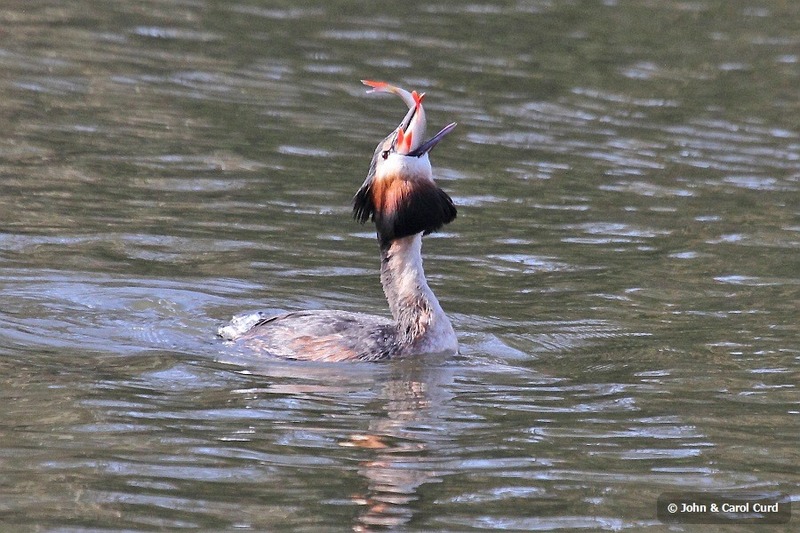 However, I did get a demonstration of Great Crested Grebe table manners when one of the pair surfaced with a relatively huge fish – relative to the Grebe’s mouth and neck, that is. I couldn’t believe the Grebe could really tackle it. It tried tossing it back a couple of times without success. It dropped it a couple of times, too, only gamely to retrieve it and try again. All this time the poor ol’ fish’s tail was flapping. I think the Grebe’s main course was a Rudd (Scardinius erythrophthalmus), judging by the orange-red fins and slightly protruding lower mandible. A Roach looks similar but apparently has a protruding top mandble (‘cos it’s a bottom feeder whereas the Rudd is a surface feeder, it says here). So, I’m going with Rudd; it was certainly proving to be hell to swallow. 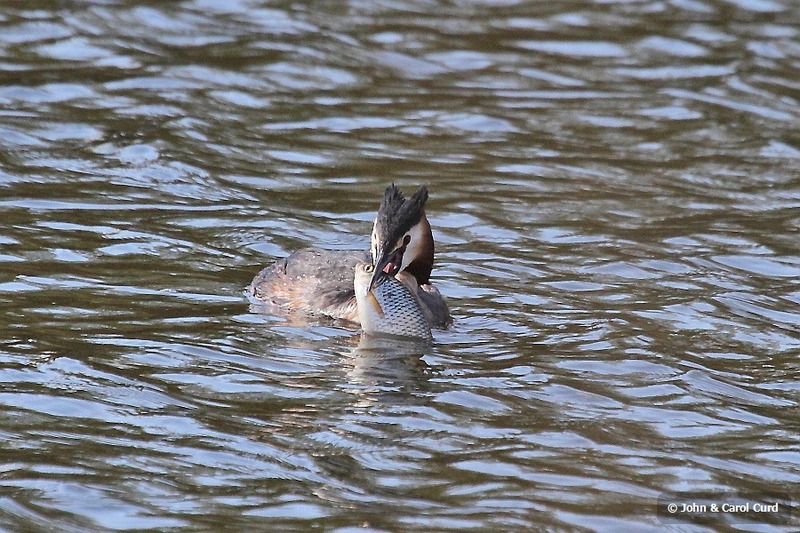 Eventually the Grebe seemed to get most of the hapless Rudd down and swam off with a satisfied look on its face. 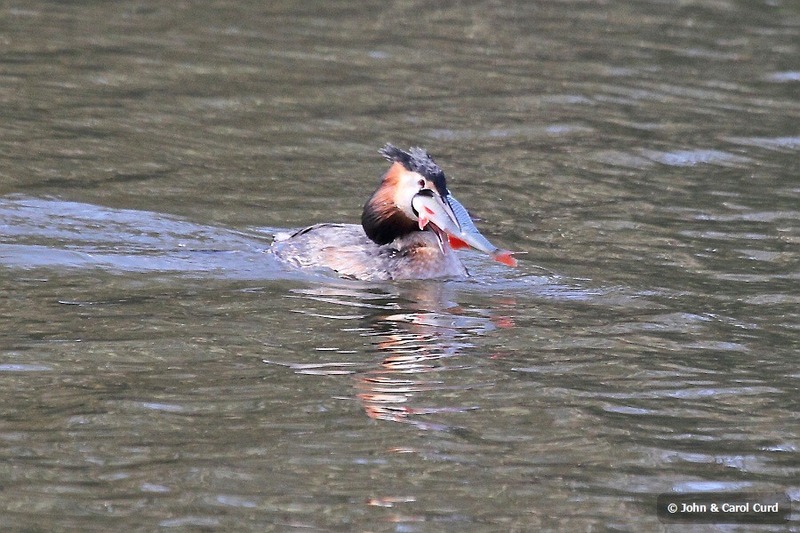 Oh, no, wait a minute, that satisfied grin is just the fish’s tail wedging the Grebe’s beak open. I don’t think that Grebe will need to eat again for a week. Wondered where the title pun was going for a while. Some excellent duck photos, but they need to be in your “Birds” gallery cos how else am I to check bird IDs quickly? Quite right and I’ve put the photos in my Webs Source folder, just not regenerated it just yet. I’ve got a Carrion Crow to add, too.